A Bangkok woman said she was all flustered and just didn't know what to do when an ambulance was blaring its horn trying to get past her. The driver of the ambulance was desperate to try and get to Bang Plee hospital as a woman was about to give birth in the back. But "Nam Oi" told Bang Plee police she had never experienced this situation before. Instead of moving over to let the emergency vehicle pass - standard procedure in most countries - she remained in the fast lane on Thepparak Raod just annoyingly braking on and off. She might have known the law; she is a sales rep for a major car dealership. The video of the incident had received a lot of comment online. 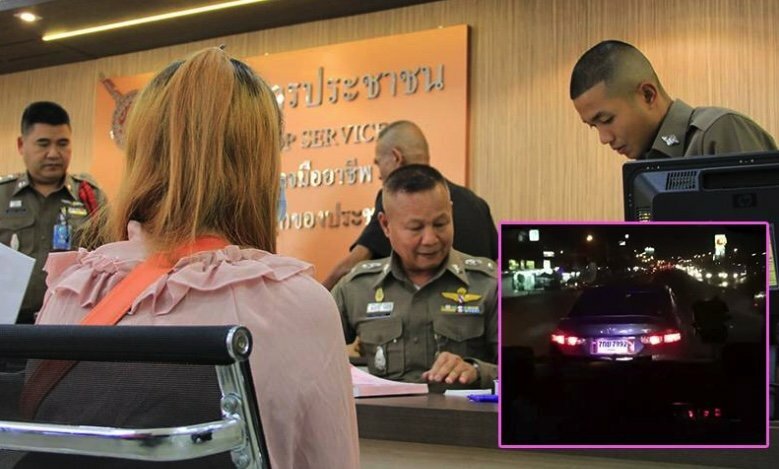 The cops listened to Nam Oi's excuse and fined her 500 baht after she turned herself in. Her statement pretty much sums up the majority of Thai drivers. What a pony excuse. How about just move out of the <deleted> way. The fine is also pathetic and inadequate. Disqualification and at the very least some kind of driver improvement course needed. Take away her licence as she appears to be unaware of the Highway Code. She didnt know what to do pathetic excuse, just get out of the way. Another case of a very selfish driver not caring about others. Anytime I hear a siren when driving I check my mirrors and surroundings to know where the sound is coming from. Sometimes you can quickly work out it's coming from the other side of the road so there's no need to worry. Other times you know it's coming from behind you so you best prepare to move out of the way so the emergency vehicle can get through easily. It's your responsibility as a driver and a decent person. This is called common sense and empathy. Empathy, or compassion, is supposed to be quite an important pillar within Buddhism. How in heck can she hear or be bothered when he is on her mobile phone. The nerve of the ambulance. I think the problem with the so-called driving test here is it doesn't filter out the drivers who are too nervous and who are likely to start panicking under any form of pressure. On their day these drivers can be just as much of a danger as the arrogant, reckless ones. There needs to be an actual part of the driving test that takes place on the public roads in the thick of the mayhem. Then and only then, if the applicant passes should a license be issued.